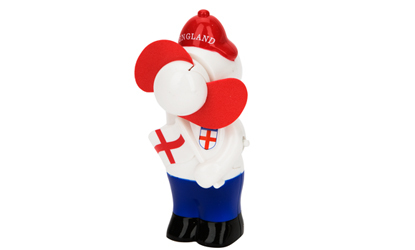 Keep your cool when the heat is on with this hand held mini fan, perfect support for England fans abroad.The hand held mini fan is dressed in blue jeans, white shirt and red cap with the words England, holding his England flag. Yes, this is a true England fan in both senses of the word! The battery powered hand held mini fan is willing to travel, fitting into most pockets and bags.